The Dysfunctional Pilgrim: Sweet! Sweet! The makings of a perfect weekend have just begun. First off, I finally got to play around in the kitchen. 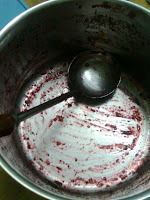 I made jam-Mulberry jam. What berry? Yes, we grow that in our garden. In fact, it’s the only plant that’s really thriving in our place; which is rather ironic because it’s not a local plant. What, we kill out starfruits but the mulberries survive?? Strange world. 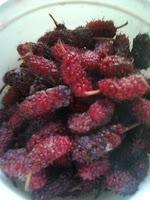 Anyway, the tradition is, Arnan plants and trims the mulberry plants, I pick the berries and make the jam. 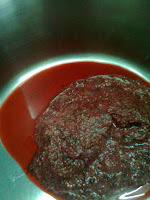 The last time I made jam, it ended up in a very very sweet syrup, due to the lack of pectin. According to a recipe I found on the internet, we don’t need pectin, but somehow it just didn’t work out. Why didn’t I use pectin last time? Because we couldn’t find any. No one here seems to sell it. And we were having boxes upon boxes of mulberries in our fridge so….well we had to do something before they all grow rotten. But this time, I have pectin thanks to Uncle Chin Keong who came back from Canada. So everything was just so much easier. Then, grind (well, I blended la). It ended up looking like human liver mushed up, all blood-red and well, mushy. Modern cannibalism, anyone? 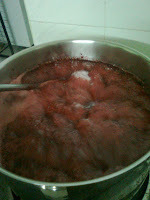 Making jam requires lot of sugar (seven cups!! )…I mean, patience. You need to stir, and stir, and stir, and…stir some more. The whole jam making was based on guess work, so hopefully I guessed right. There was one part of the instruction that rather baffled me, which was to seal the bottles with paraffin wax. I suppose it’s to keep air out, but where do I get paraffin wax?? Should I use masking tape? My mom pooh-ed the idea. “Your uncle didn’t do anything of a sort.” And apparently, Canadians are always right. *shrugs* Managed to make......er,four to five jars. I forgot. The best part: Licking the pot. Yes, the WHOLE pot.O.o Went on a slight sugar high after that. I tend to go a bit wild when I have too much sugar. No, I’m not hyperactive…but my thoughts go a bit crazy. Which is probably helpful as I need to produce a script out from nothing (sigh) in two days. Mulberry jam is the best thing ever! It makes me feel so…up! So gleeful. Wheeeeeeeee! And with a splash of peculiar. A splash? Nevermind. If I were Prime Minister, I’d issue a decree that every household must have a jar of mulberry jam. It’d increase productivity and satisfaction, I tell you. Oh, the rest of the lovely weekend is this: probably going to watch Inception with my S’ban friends tomorrow morning, going to SJ for family dinner at night, and maybe on Sunday meet up with d’na folk. At the moment, all this is rather tentative (‘cept the dinner), but so what? It’s good to be optimistic (wow, this jam is really having an effect on me). Friends, family, jam…mmmm…what more could one ask for? A…book? Hey, I have a new book to read too. Haha.. Writing that script would probably be rather enjoyable too. Yum. Thank God for fantastic weekends. And mulberry jam, of course.